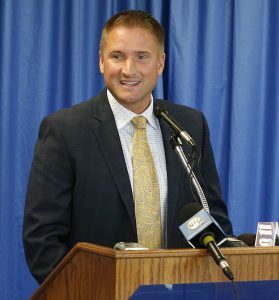 Paul Plinske, Director of Athletics at University of Nebraska at Kearney, joins the 1.Question podcast to discuss UNK’s recent announcement that it will drop three sports as part of a campus-wide plan to close a $3.4M budget deficit. Plinske addresses stabilizing the department, facilitating student-athlete transfers, and outreach to donors and alumni. Key takeaways include necessity of an open line of communication and guiding principle of taking care of one’s people. Eliminate the barrage of articles and time-consuming searches. Efficient D1 athletics news in a daily email. Sign up to receive D1.ticker today! We are a Creative Advertising & Development Agency that focuses on developing partnerships with our prospective clients. The purpose of our methodology is to complement and strengthen the impact of each discipline. Parker Executive Search is a leading global retained executive search firm. We have a national and international client base including top intercollegiate athletics programs and sports businesses, leading colleges and universities. Learfield is a diverse media enterprise anchored by our core collegiate business managing multimedia rights and sponsorship initiatives for nearly 130 institutions, conferences and arenas nationwide. The Sports Leadership Institute enables unrivaled opportunities for sports leaders to share best practices, lessons learned, behind-the-curtain strategies, and discuss the most important issues and challenges in a safe setting. We’re here to redefine your game day experience and take care of your tailgating needs from start to finish. Service is at the core of all we do, and the fan experience is at the forefront of our approach to tailgating. At Ticketmaster, we strive to put fans first. Every day we're listening to your feedback and working to improve your experience before, during, and after events. Athlete Viewpoint is a comprehensive data collection and analysis platform designed for leaders in athletics who value their student-athletes, coaches and staff above all else. We provide detailed, actionable information to assess your program, enhance performance and manage risk. The top storytelling brands in college sports use the INFLCR platform to store, track and deliver their creative staff's internally-curated content to their student-athletes and other brand ambassadors for sharing on social media.